Some months ago a friend asked me if it would possible to create ambrotypes on silver tin for her jewellery design. She is a jeweller and someone who has been very enthusiastic in helping me with my wet plate work. So I started researching this idea of ambrotype jewellery, and discovered that various artists have already succeeded in doing it, for example Steve Ingram, and his wonderful series of mini tin-types. But simply knowing a thing is possible is not quite the same as doing it yourself. For one thing, I didn’t have a camera which could make such tiny plates. So I filed the idea at the back of my mind. Then, a few weeks back, I tried the infamous “xerotype” process use by Gerald Figal (and his band of self-styled “Collodion Bastards” group on Facebook (‘Wet Plate Work of Questionable Parentage‘). 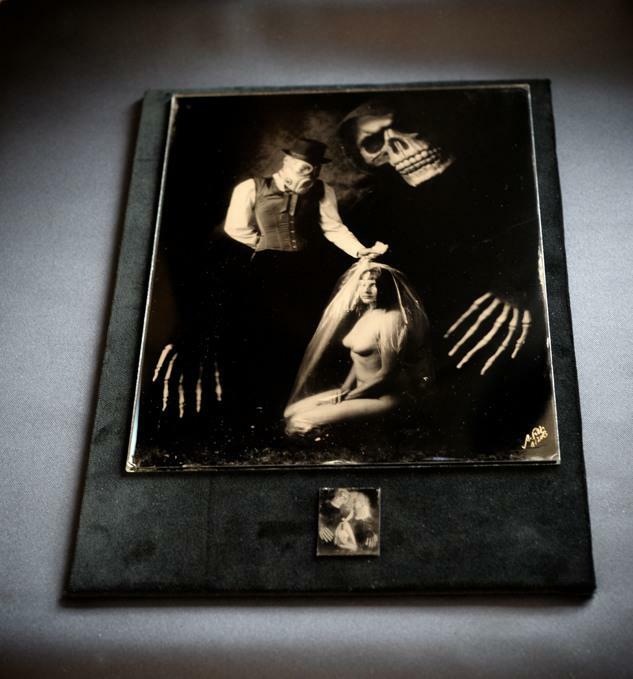 For those unfamiliar with this process, which is also sometimes called Figalotype, after the man who so elegantly pioneered it, or sometimes also known as an Arturotype, after the man it sends into a rage, it basically involves displaying an image on a computer monitor, and then re-capturing it on a glass plate. What you see here, is my first attempt, a reasonably sizeable 8×10″. Although it is always interesting to try new processes, I did have some doubts about the usefulness of the “Xerotype”. It seemed to me for big pictures it is foolish, because you can see the pixels from the computer screen on the plate, simply by using a magnifying glass, which is obviously one of the first things any photographically obsessed person such as myself would do. But for very small images I thought to myself, this just might work. So last week when Shane, who also knows a jewellery designer, said he would like to make small ambrotypes, that was the starting gun. I got down to work. 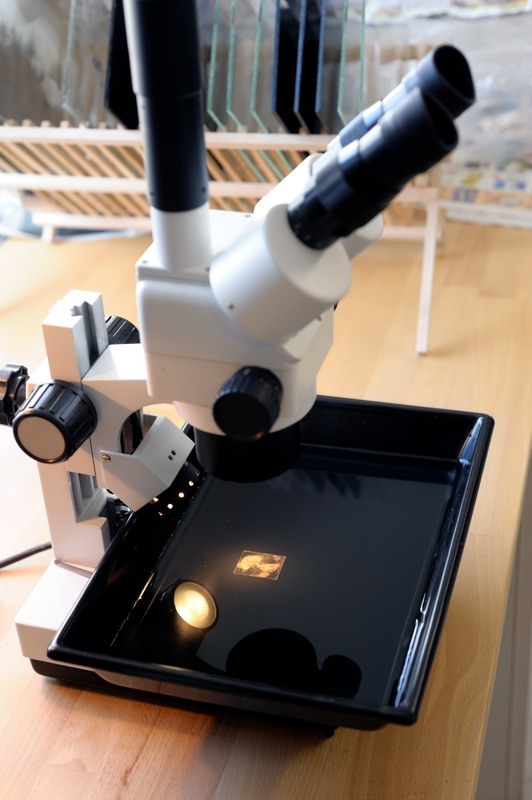 The first thing I did was take my 5×7″ plate holder and build an insert for it that could take a small microscope glass slides, which I found in masses on the workplace of my wife, who is a biologist. 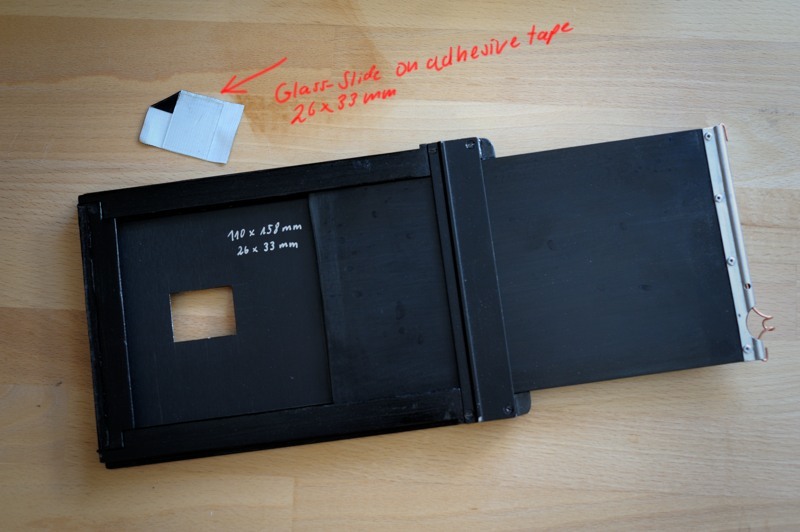 In the image you see here, the slide is held in place with tape. 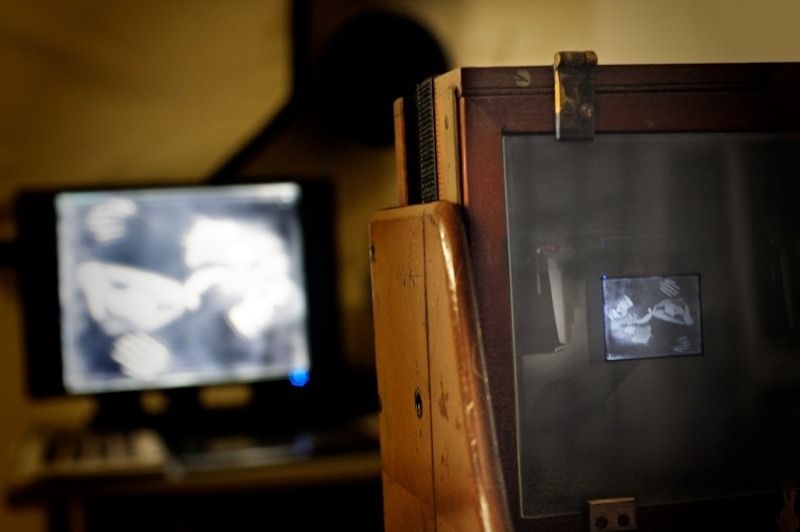 Then, I displayed my plate Breathless on my 26″ computer screen, directed the wetplate camera on it. and captured the image with 30sec exposure on the tiny wetplate collodion plate. Well, the tiny-type isn´t that sharp as I hoped, my 1890 aplanat lens from my used steroscopic plate camera is not the best and I captured only a small sector of the whole image circle. Nevertheless, the result looks interesting. So I thought to myself, I’ll give Shane Balkowitsch a treat and send the teeny-weeny plate together with the big one. That way, at least if the big glass plate is damaged on the way, Shane will still have the small one. So I varnished the plate, painted the backside place, and packaged it in a small jewellery box. As you can see, the small Breathless is mirrored because it is the capture from the mirrored original plate. So one mirror reflects in the other, creating a suggestion of infinity, or, the number of attempts I am prepared to try in the interests of perfecting these bijoux images. Terrific idea and an entertainingly written article. I appreciate the mention and glad to see you putting this hybrid process to work. 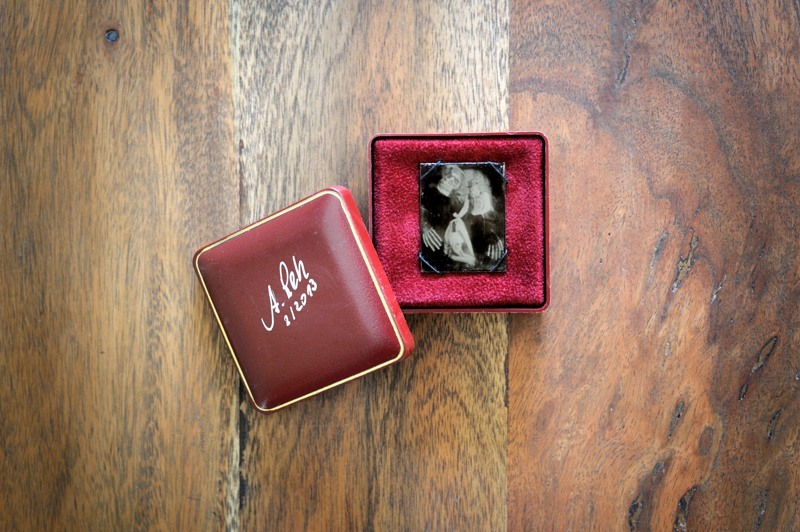 Of course, now I’m going to have to start producing tintype/ambrotype jewelry now too!